The pack rides outside Monforte de Lemos during the fifth stage of the Vuelta. One to watch: There’s a football match on in Croker Park on Sunday, right? One to Sky+: Tape the football – might be good too. One to skip: I don’t watch French rugby these days unless there’s an Irish international kicking the points. Cycling: Vuelta a Espana (Eurosport 2, 3pm). Golf: European Tour, Wales Open (Sky Sports 1, 10.30am; Sky Sports 4, 3.30pm); PGA Tour, Deutsche Bank Championship (Sky Sports 4, 10pm). Rugby: Top14, Stade Francais v Biarritz (BT Sport 1, 7.15pm). Tennis: US Open (Sky Sports 3, 4pm; Eurosport, 4pm). Baseball: MLB, New York Yankees v Baltimore, (ESPN, 6pm). Cricket: Women’s international T20, England v Australia, (Sky Sports Ashes, 9.30am); International T20, England v Australia, (Sky Sports Ashes, 2pm). Cycling: Vuelta a Espana, (Eurosport, 3pm). Football: Premier League, Manchester City v Hull, (BT Sport 1, 11.30am) and Crystal Palace v Sunderland, (Sky Sports 1, 5pm); Championship, Leeds v QPR, (Sky Sports 1, noon); Scottish Premiership, Dundee United v Celtic, (Sky Sports 3, 12.30pm) and Motherwell v Kilmarnock, (BT Sport 1, 5.15pm); Bundesliga, Schalke v Bayer Leverkusen, (BT Sport 2, 5.15pm); Serie A, Juventus v Lazio, (BT Sport 1, 7.45pm); Primera Division, Osasuna v Villarreal, (Sky Sports 4, 9.55pm). GAA: Ladies football, Cavan v Down, IFC semi-final, 2.15pm; Galway v Monaghan, SFC semi-final 4pm, TG4. Golf: European Tour, Wales Open, (Sky Sports 4, 1.30pm); PGA Tour, Deutsche Bank Championship, (Sky Sports 4, 7pm). Horse racing: Live Racing, (Channel 4, 1.30pm). Rowing: World Championships, (Eurosport, 7pm). Rugby: ITM Cup, North Harbour v Auckland, (Sky Sport 4, 6.30am) and Southland v Taranaki, (Sky Sports 4, 8.30am). Top 14, Clermont Auvergne v Toulouse, (BT Sport 2, 1.30pm) and Grenoble v Toulon, (BT Sport 2, 7.30pm). Tennis: US Open, (Sky Sports 3, 4pm and Eurosport, 4.45pm). Baseball: MLB, Arizona v San Francisco, (ESPN, 10pm). 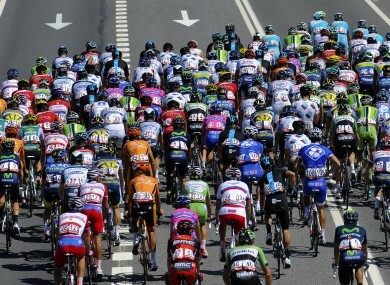 Cycling: Vuelta a Espana, (Eurosport, 3.30pm). Football: Premier League, Liverpool v Manchester United, (Sky Sports 1, 12.30pm) and Arsenal v Tottenham, (Sky Sports 1, 3.30pm); Primera Division, Real Madrid v Athletic Bilbao, (Sky Sports 3, 10.55am), Real Sociedad v Atletico Mardid, (Sky Sports 1, 6.30pm) and Valencia v Barcelona, (Sky Sports 1, 8pm); Ligue 1, St Etienne v Bordeaux, (BT Sport 2, 1pm), Nice v Montpellier, (ESPN, 4pm and Marseille v Monaco, (BT Sports 1, 7.30pm); Bundesliga, Stuttgart v Hoffenheim, (BT Sport 1, 2pm and Eintracht Frankfurt v Borussia Dortmund, (BT Sport 1, 4.30pm); Serie A, Roma v Verona, (BT Sport 2 1700 and AC Milan v Cagliari, (BT Sport 2, 7.45pm). GAA: All-Ireland SFC semi-final, Dublin v Kerry, (RTÉ Two, BBC, 3.30pm); All-Ireland MFC semi-final, Roscommon v Tyrone, (RTÉ Two, BBC, 1.30pm). Sunday Game, (RTÉ Two, 9.30pm). Golf: European Tour, Wales Open, (Sky Sports 2, 12.30pm); PGA Tour, Deutsche Bank Championship, (Sky Sports 4, 6pm). Rowing: World Championships, (Eurosport, 7am).